The Republican Governors Association (RGA) and its Democratic Counterpart will be in a "$100 million-plus chess match for control of the foundation of American politics for the next 10 years," according to the Washington Post. While many accross the nation are focused on the fight for the control of congress, the nation's gubernatorial races are garnering little attention. However, the National Governors Association is indeed focused on the races for chief executives of at least 30 states where the current governors are either term limited, have decided not to seek reelection, or where there is a competitive race for the governor's mansion. According to WaPo the major effect of a change in guard could first be seen in states' efforts to redistrict - redistricting could lead to a significant political advantage for the party that controls the "redistricting machinery." Another, less immediate, effect of this year's races will be in the presidential election arena. 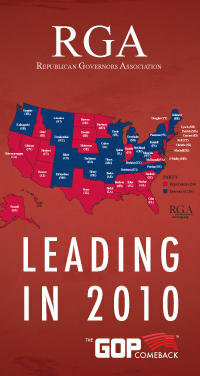 A Republican majority in state chief executives could hinder Obama's hopes for reelection. As Nick Ayers, executive director of the RGA, states "If we do what I believe we can do this year, it creates a very difficult map for Obama in 2012."